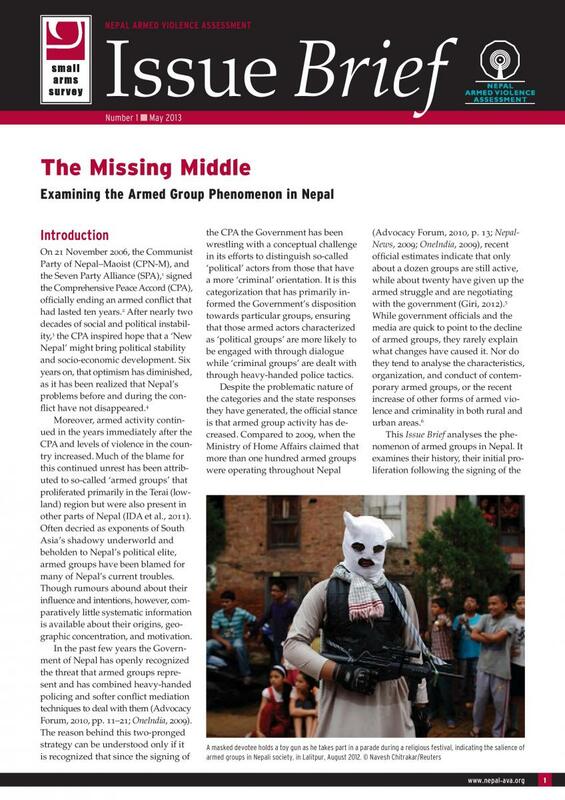 This publication reports on the history of the country’s armed groups, their initial proliferation following the signing of the CPA, their development and overlap with other societal groups, the reasons behind their recent decline, and their relationship to the state. On 21 November 2006, the Communist Party of Nepal-Maoist (CPN-M), and the Seven Party Alliance (SPA), signed the Comprehensive Peace Accord (CPA), offically ending an armed conflict that had lasted ten years. After nearly two decades of social and political instability, the CPA inspired hope tha a 'New Nepal' might bring political stability and socia-economic development. Six years on, that optimism has diminished, as it has been realized that Nepal's problems before and during the conflict have not disappeared.